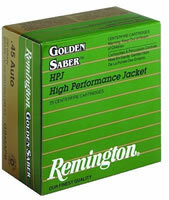 Details: Golden Saber high performance jacket (HPJ) handgun ammo, the driving band makes the difference bullet diameter directly ahead of the driving band is reduced from groove to bore diameter, so the bullet is precisely aligned before the driving band engages the rifling. The result: match grade accuracy and reduced barrel friction. The driving band locks the jacket and core together for maximum weight retention and core/jacket integrity.